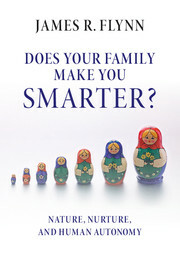 Does your family make you smarter? James R. Flynn presents an exciting new method for estimating the effects of family on a range of cognitive abilities. Rather than using twin and adoption studies, he analyses IQ tables that have been hidden in manuals over the last 65 years, and shows that family environment can confer a significant advantage or disadvantage to your level of intelligence. Wading into the nature vs. nurture debate, Flynn banishes the pessimistic notion that by the age of seventeen, people's cognitive abilities are solely determined by their genes. He argues that intelligence is also influenced by human autonomy - genetics and family notwithstanding, we all have the capacity to choose to enhance our cognitive performance. He concludes by reconciling this new understanding of individual differences with his earlier research on intergenerational trends (the 'Flynn effect') culminating in a general theory of intelligence.